I’m a believer in all things rural, including the seal harvest. I wear my father’s seal skin boots that are more than 15 years old and last year purchased a seal skin coat. I could give it away a dozen times a day from all the people I meet that would also like to have one. More must be done to make these products more readily available to people of the province. 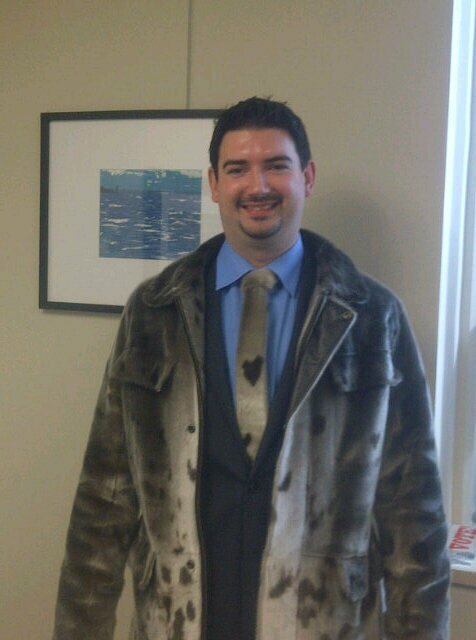 The seal skin tie I have, which certainly has “heart” was purchased for $60 from GNP Craft Producers in my District. They have a website http://www.gnpcrafts.ca. They also make great belts for $40, bow ties, slippers, mittens and more. Let’s continue to show our support for the seal harvest, as it is humane, sustainable and environmentally friendly. As the blog simply states, “Live Rural” and “Experience the Great Northern Peninsula” is all about learning, understanding and sharing my rural roots with the world. For those who have dropped by our constituency office in St. Anthony, the public gallery has an array of local art from a French Shore Tapestry, photographed seal by Chris Patey, hooked rug, sweat lodge artwork, icebergs, Grenfell embroidery, painted purity products, dories, fish and many pieces that reflect our rural region. There is a collage of images from across the Great Northern Peninsula. 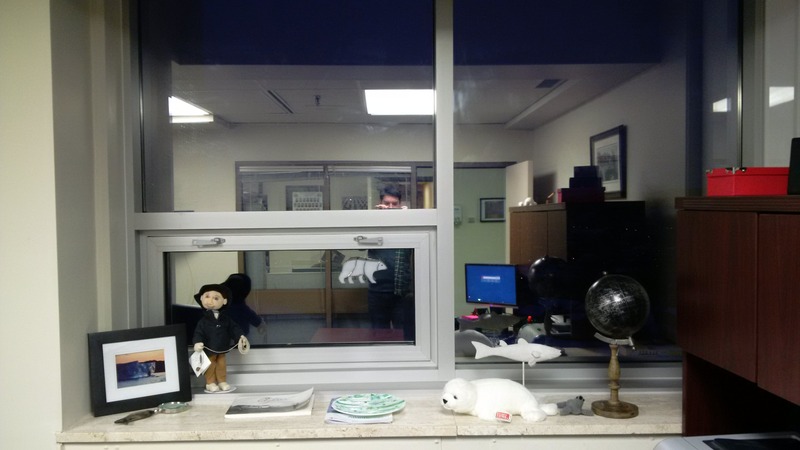 However, my office at the Confederation Building in St. John’s, NL is no different. It includes many handmade items and pieces of art that I have made myself or purchased from others. I am always searching for as much local stuff as possible. There is a lovely Chris Patey piece of Iceberg Photography on the northern tip, with a magnifying glass and fish handle, La Mousses (The French Fisherman) that I’ve been told resembles me is from The Guardian Gift Shop at the French Shore Interpretation Centre in Conche, but was made by Loretta Decker of L’Anse aux Meadows. Outport NL by Candace Conchrane is next to a handmade glass plate made at the St. Anthony College of the North Atlantic. The fused glass polar bear comes from the Grenfell Heritage Shoppe in St. Anthony. There is a stuffed seal that was given to me as a Christmas present, as well as a fish and smaller seal. I purchased art from Bruce Pilgrim, originally from Main Brook, the former Englee Plant which was framed by his wife Maureen, owner of Island Images Gallery and Framing Shop. It is very pleasing after all the lobbying, letter writing, petitions, telephone calls and more that Government issued a clean-up order which resulted in $1.7M to remove and re-mediate this site. The iceberg was painted by myself in three hours when I took a class with George Bussey, originally of St. Lunaire-Griquet. I enjoyed this immensely and encourage others to take it up as a hobby. The hooked rug, I did as well under the instruction of Sabrina Gaulton of Anchor Point. It took about 50 hours to make this tiny rug. I would like to do another, when time permits. Thus far, time has not permitted. The “Lonely Harbour” is a piece I purchased at the Bits’n Pieces Cafe in Conche from local Natalie Byrne. The splitting table imagery reminds me of Noddy Bay or Raleigh. It was done by William Bartlett of St. Lunaire-Griquet. The polar bears were bought at Shoreline Flower’s N’ Crafts in Sandy Cove and the ax on the chopping block a gift from Port Hope Simpson. The “Return of the Sealers” is my most recent purchase from the Savage Cove Come Home Year. It is a Linda Coles piece, who is originally from Savage Cove.